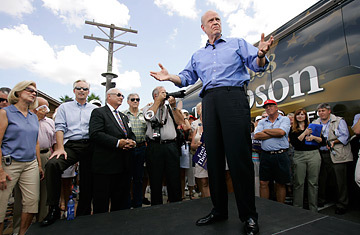 Republican presidential hopeful Fred Thompson speaks to a crowd of supporters. Fred Thompson was mugged last week. Worse still, the perpetrators were folks he knew, the kind of people he had reason to believe might actually love him. The lawyer-lobbyist-actor-politician from Tennessee, who played Hamlet on the Potomac all summer before finally joining the race for the Republican Party presidential nomination on Sept. 5, had imagined his arrival would be greeted with hallelujahs from both the rank and file in the party and its tastemakers in Washington. After all, with the incumbent second-term GOP president wildly unpopular, and with Republicans across the country ambivalent at best about the field of would-be successors who had been campaigning all year for their affections, Thompson supposed that he would be greeted as a savior once he made his candidacy official. Instead, Thompson's first full week of campaigning was largely panned, not just by Democrats and staffers from opposing GOP campaigns, but by conservative opinion leaders like Robert Novak and George Will. Novak's attack on Thompson was targeted. After declaring that "important neutral Republicans" had privately declared that Thompson's campaign had "crashed and burned on takeoff," Novak immediately settled on an explanation: staff. "While Thompson offered obligatory conservative slogans in New Hampshire, Iowa and South Carolina," wrote Novak in one of his regular columns, "he was not the white knight whom worried Republican loyalists desperately desire. His debut might have been more blood-stirring had his gatekeepers not turned away talented helpers." That Thompson chewed through a year's worth of campaign advisers and staffers before even getting into the race is well known. But Novak's assertion  that Thompson's woes were caused by turning away some quality job applicants  takes the cult of the consultant to new levels of irrationality. "I love the notion that we're going to lose votes because we didn't hire certain consultants here in town," says a current Thompson aide. That aide is biased, of course; unlike some of the remaining GOP talent out there, he was given a job by the Thompson campaign. But the idea that Thompson's troubles are a function of the fact that he declined to employ some willing GOP operatives in Washington ignores what has gone right  and wrong  with the nascent Thompson campaign. The premise of Novak's argument  and Will's, as we'll see  is that Thompson has been a disappointment as a candidate since announcing 11 days ago. And there's no question the former star of Law & Order was less than riveting both during his performance on The Tonight Show with Jay Leno and during his inaugural week of campaigning. The question is whether Thompson's lackluster debut was the result of bad advice from his staff. Every candidate benefits from good advice. But Thompson's performance weaknesses were his own. And they go to the broader, and persistent, question about how badly Thompson really wants to be the 44th president of the United States. "The question with Thompson is whether he knows why the hell he's running," says a GOP operative who may yet sign up wit the Thompson campaign. "He can't learn that from a consultant. It has to come from within." George Will addresses this far more serious problem in his column. Declaring Thompson's plunge into the presidential pool "more belly flop than swan dive", Will goes straight at the biggest weakness Thompson showed during his launch  an utter lack of clarity about why he's running in the first place. Will shows that Thompson not only doesn't know much about his opponents' positions on the issues, he doesn't know much about his own. But then Will digresses down in the weeds of one of his great pet peeves  the fact that Thompson was one of the key sponsors of the McCain-Feingold campaign finance reform bill back when Thompson was in the Senate. For Will, support of McCain-Feingold is immediately disqualifying for any presidential candidate. But my guess is that the rest of the GOP primary electorate won't be so categorical about one issue. Which brings us to the big problem with the way Thompson's launch was panned in general in Washington, especially by the Republican-conservative politico-media establishment. Winning elections is, in the end, about winning more votes than your opponents. And up until the day that voters actually cast their ballot for their favorite candidate, the most common way to get a sense of which direction the electorate is leaning is by taking a poll. Polls are just snapshots, and they certainly do not tell you the whole story about the state of a race for elected office. But they certainly can identify trends. And the fact is that in the national polls, Fred Thompson's numbers rose, in many cases substantially, in the first week after he announced he was running for president. They rose, in fact, to the point where almost every national poll showed that he had taken over second place, behind a weakened Rudy Giuliani, in terms of preference by Republican primary voters. There's no question Fred Thompson has underwhelmed during his first few weeks as a presidential candidate. His speeches are not sharp, he has flailed when asked simple questions about where he stands in comparison with his rivals for the GOP nomination and he has struggled to be coherent on the question of what should be done, literally, with Osama bin Laden. But what Thompson hasn't done is drop in the polls. In fact, he's gone up. He's now solidly in second place in national polls, behind Giuliani, whose standing has eroded significantly in recent weeks. Thompson is showing post-announcement strength in some key state polls, most importantly in South Carolina and Florida. And in this crazy election cycle, especially for Republicans, moving up a few points in the polls is worth far more than the written appreciation of some of the titans of the Washington GOP opinion machine. As Todd Harris, Thompson's communications director says, "The Beltway is always a lagging indicator."